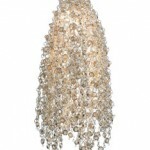 Posted November 7, 2012 by Norburn Lighting and Bath Centre & filed under Decorative Lighting Fixtures, New Products . 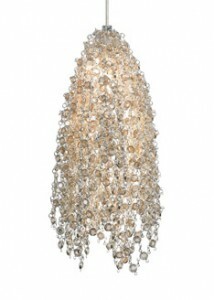 Element Crystals draped elegantly, like fabric, over a simple MR16 bulb. The clear or golden shadow crystals are artfully set throughout a web of sterling silver chain with satin nickel fittings, delivering minimalistic-approach bling. Hanging 8” long and 3” wide, Mademoiselle No. 2 could be staggered in a row over an elegant bar or clustered in multiples to create a breathtaking lighting sculpture in a lobby or at the bottom of a grand staircase; in a women’s upscale spa; or at the entry of a women’s clothing boutique. Singly, the Mademoiselle No. 2 could highlight individual cocktail tables throughout an elegant lounge; or in a resort’s jewelry shop, spaced over bountiful display cases.